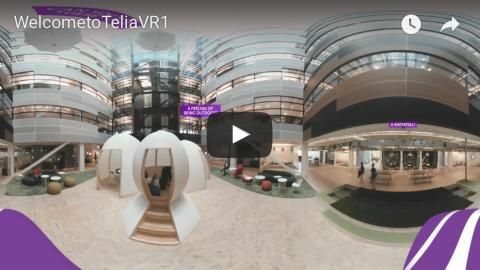 Check out one of the largest ABW implementation projects in Europe - Telia's new head quarter in Solna, Stockholm. In Sweden the event is also known as the largest office move in history. After 57 years in old worndown premises on the other side of town, Telia decided to go all in when entering their new home, thus emphazising the ambition to be The New Generation Telco. To enable this giant in reaching their goals of increased collaboration among colleagues and minimized office friction, Flowscape was brought in as an IT solution supplier. The impressive building designed by the architects at Tengbom has over 650 meeting rooms and hosts 3500 employees. Together with the Telia Company Cygate, Flowscape installed 268 room panels and 26 large billboards. To make room booking easier and quicker, Flowscape implemented indoor positioning, as well as room and presence indication sensors. This technology together with Flowscape's features - Space finder and Equipment finder - allows Telia's employees to book desks or rooms with just a click, and to find vital office equipment in the office. Collaboration and interaction can suffer severely in a pure ABW environment such as Telias. To aid the thousands of employees in quickly finding and contacting each other we also added our Colleague finder. And thereby giving the staff futher practical use of their mobile phones, and at the same time proving that Telia indeed is The New Generation Telco. Psst! For best effect, view the video in a pair of VR glasses on a browser that supports 360 videos.